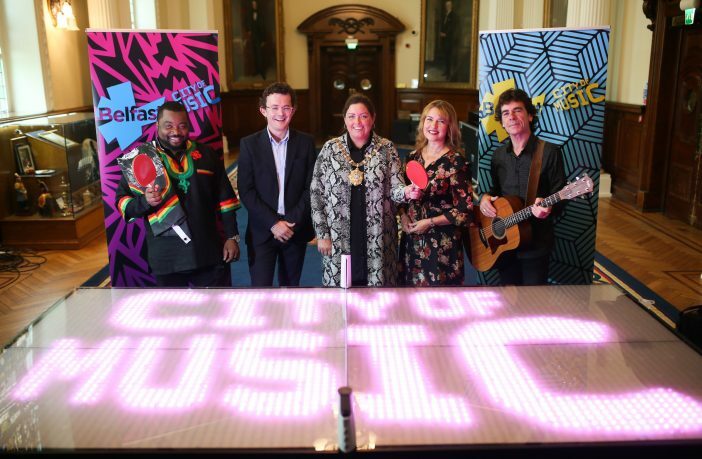 Joseph Rickets (ACSONI), Gareth Neill, BID Manager, Lord Mayor Councillor Deirdre Hargey, Michelle Baird, Ulster Orchestra, and Davy Watson at the launch of Belfast Music Summer Season. The pop-up summertime animation programme will shine a spotlight on Belfast’s rich musical heritage and local music scene, bringing music to all corners of the city over the coming weeks. 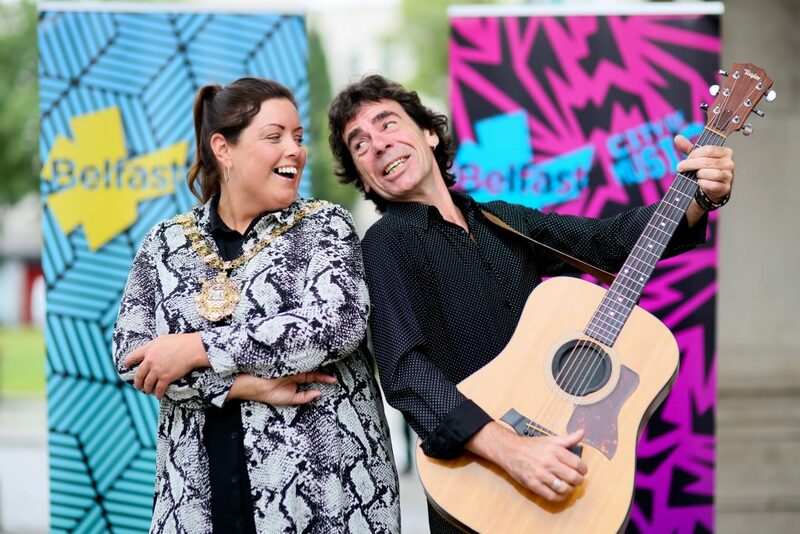 Lord Mayor of Belfast Councillor Deirdre Hargey with local singer/songwriter Davy Watson who is taking part in Belfast Music Summer Season which was launched at City Hall today. The pop-up summertime animation programme will shine a spotlight on Belfast’s rich musical heritage and local music scene, bringing music to all corners of the city over the coming weeks. Local singer-songwriter Davy Watson – who has enjoyed huge success since his days touring with Phil Lynott and Bob Geldof in the 70s – and members of ACSONI (African & Caribbean Support NI) joined the Lord Mayor for a game of musical ping pong at City Hall to officially launch the programme. 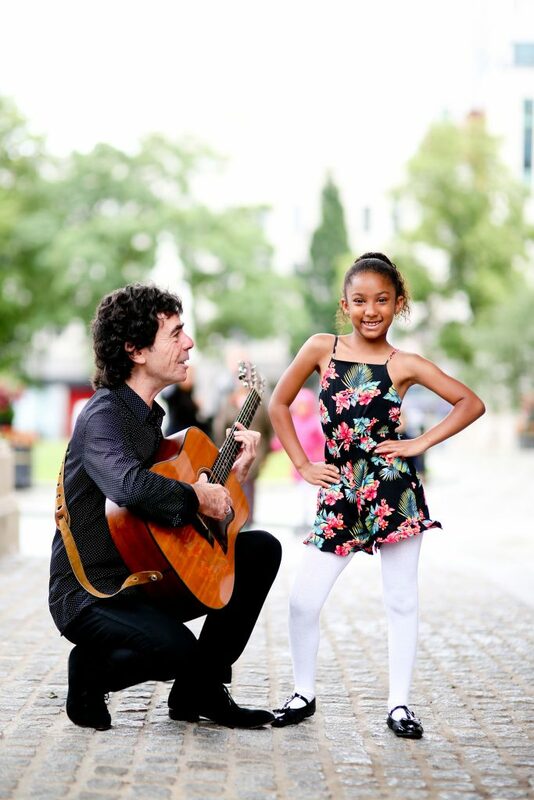 Local singer/songwriter Davy Watson and Angel Pina from ACSONI are just two of the artists and performers taking part in Belfast Music Summer Season which was launched at City Hall today. The pop-up summertime animation programme will shine a spotlight on Belfast’s rich musical heritage and local music scene, bringing music to all corners of the city over the coming weeks. Floral Hall comes to City Hall, 24 August. For more details on all the events and to download a copy of the programme, visit here and join the conversation on social media using the #belfastmusic hashtag.